Start the day off right with homemade granola, not too sweet, made with lots of grainy goodness. I go back and forth between buying breakfast cereal for its convenience and completely abandoning it for its questionable nutrition. Yes, really. I said that. I’m sorry, mamas, but it’s true. That thing that makes our life so easy is really not all that good for us. Call me the bad cop. Most commercially-made breakfast cereals are full of sugar, salt, and heavily processed grains. My kids love them. Often that’s what they will choose for their birthday breakfast. And yes, on your birthday, I will buy chocolate-covered sugar bombs for breakfast. I just won’t let you make a steady diet of it. For regular days, I often buy Joe’s O’s from Trader Joe’s. At $2 a box it’s an okay “fill-the-gap” convenience item, but the ingredients list still has a lot of things I can’t pronounce. I’ll still buy it. Life is too short to freak out too much. But, when I can, I want my kids to have real food. These days, I’m making this granola. It’s not too sweet, it’s easy to mix up, and it disappears in the blink of an eye. My kids love it. And for the last two weeks, no one has noticed that there are no boxed cereals in the pantry. Win. This batch fills three quart jars if I move fast enough. My people eat it up pretty quickly. Demerara sugar is a lesser-processed sugar. You can use 1 1/4 cup honey or maple syrup if you’d rather and omit the sugar and water. I’ve had my share of burnt batches of granola. No fun. Over time, I’ve found some tools that make the process easier, cleaner, and tastier. Sheet pans – I struggled forever with unevenly cooked granola in 9×13 pans. These sheet pans work so much better for me. Silicone baking mats or parchment paper – these liners make it so effortless to remove granola from the pan and to prevent sticking and burning. 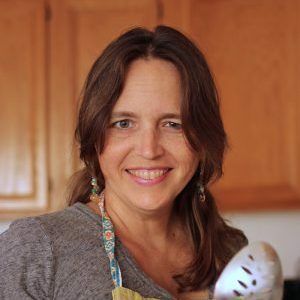 Quart-size canning jars – I love my jars. I use them to store baking mixes, sugar, bulk yeast, and granola. A canning funnel – I like to fill my jars without a lot of mess or waste. A funnel makes it easy. Preheat the oven to 350°. Line a sheet pan with parchment paper or a silicone baking mat. 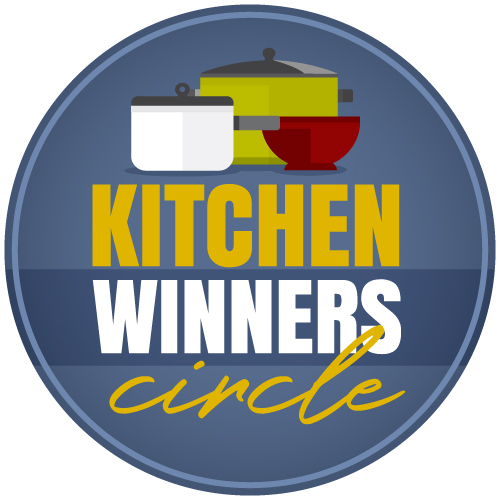 In a large mixing bowl, combine the oats, coconut, wheat germ, wheat bran, flax seed meal, and salt. In a small saucepan, combine the sugar and water, stirring until dissolved. Add the oil and vanilla. Pour the wet mixture over the dry, stirring to combine. Spread the mixture into the prepared pan and press firmly. 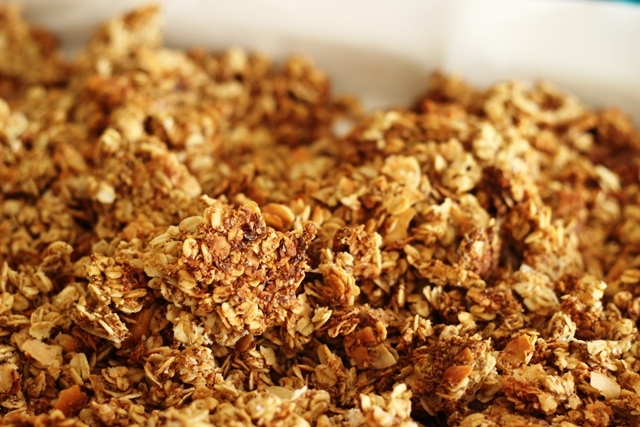 Bake the granola for 30 minutes, watching for overbrowning on the edges. If it starts to get too brown on the edges, move the edges to the center with a spatula. Allow to cool completely and then break into chunks. We love granola too. Last summer, hubby and I spent a weekend at a bed and breakfast in the Amish Country in Lancaster, PA. For breakfast one morning, they served yogurt and granola parfaits. We loved it so much that I asked the woman who owns the home where we stayed and does all of the cooking if she would share her recipe with me. To my surprise, she was very obliging and did. Since then, I’ve been making it. It makes a huge amount so when I do make it, I share some with my neighbors and family and still have plenty left over for us. It freezes well too. I will be making some this weekend for the freezer because as mentioned in some previous posts, hubby and I are hosting a Valentines Dinner Party in a couple of weeks and the favors that I’ve decided to give out are “breakfast baskets”. Included with several other breakfast items will be this granola bagged up in clear cellophane “Valentine” bags. I made your cranberry/orange granola recipe last week. I will have to give this one a try. The other night I came to this site looking for a muffin recipe to make to go with our soup for dinner. My girl and I made the mix and match muffins with mini chocolate chips. They were amazing! This recipe is now my new favorite. Thanks! Jessica, I have two questions. My daughter has celiac disease, so the wheat germ and wheat bran are a problem. Any idea what I could substitute for those two ingredients? I think it’s too much to simply eliminate. Also, where do you find sunflower oil? I’ve seen it in several of your recipes, and I’m not finding it at the stores I shop at. I could go to a TJ’s, but it’s not very close. Just omit the wheat ingredients. You could lessen the liquid just a touch and be fine. I’m finding the sunflower oil in lots of places now: Ralphs (Kroger), Trader Joe’s and Walmart. Very similar to my granola recipe. Try coconut oil! Delish. I often sub applesauce for part of the honey/sugar and no one notices. Does the applesauce dehydrate enough so that it doesn’t mold on the shelf? I’d love to reduce or omit the sweeteners. I’ve never had a problem with mold but I live in the desert, so really nothing ever gets moldy here. I bake at 300 for two hours. Does any food last long enough at your house to get moldy? This granola looks very good. 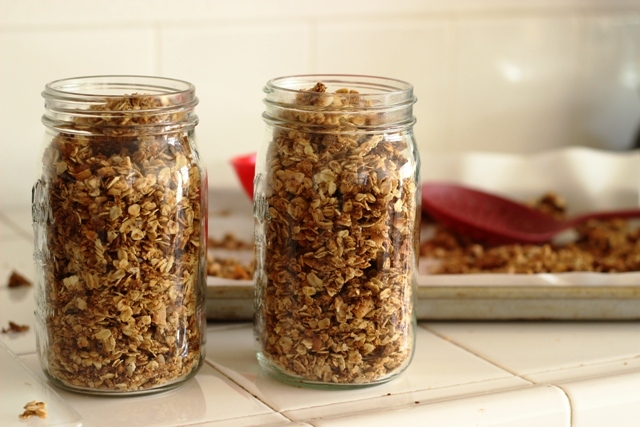 Have you tried that Lazy Granola method over at Moneysaving Mom. Crystal’s easy method is great, it only cooks 10 minutes and then you go to bed and leave it in the oven overnight. I’ve tested it and its crisp in about 6 hours. I think I’m gonna try her method with your recipe, I just love that you’ve added coconut chips; I’ve got tons to use up ’cause we’re just not eating lots of monkey salad like we used to. I tried that method years ago and didn’t like how it turned out. That led to my pressing in the pan method which I do like a lot. so if you wanted craisins or nuts in the granola, would you add that before or after the baking? I’m thinking possibly the nuts before and the fruit after? Yes. You don’t want the fruit to get too hard and dry. If the nuts aren’t already toasted, add them before. They’ll toast nicely in the granola. Yummy! I’m going to make this. We eat so much oatmeal I am ready to purchase in 25 lb. bags (as soon as I run out of what was purchased for a killer sale price at Sprouts). Thank you for your continued inspiration. I don’t think you can find anything at Trader Joe’s except the oats, salt, oil and vanilla. You can use more oats and less of the other things and use brown sugar instead of demerara if you like.It won’t be the same but it will be cheaper. Thank you for breakfast recipes! Do you think I should try to sub something for coconut chips or just omit? Can’t find them anywhere (no TJ’s nearby). Omitting them is fine. I forgot that I don’t buy Trader Joe’s kind because they have sugar in them. Have you ever used this to make granola bars ? Do you think that nutritional yeast would work in place of the wheat bran in this recipe? I have a box of nutritional yeast that I’ve only used from once, and I want to use it up. Would it taste funny? I’m sorry I have no idea. I have never bought that. I love this granola! I eat granola for breakfast nearly everyday, so I have been trying different recipes over the last few years. This one is a new favorite (among other favorites are one from my America’s Test Kitchen cookbook, another from Nekisia Davis, also BraveTart’s and Alana Chernila’s). I appreciate the simplicity of it – no nuts to chop or seeds – making it budget friendly. Also no for stirring every 10 minutes! Demerara sugar was a new ingredient for me, and I was curious to try it. Found a container at Walmart of all places, but it was not available at regular grocery stores in my area. I really like the flavor! To get it nice and crispy/crunchy in my oven I bake it at 325 for 35 mins. 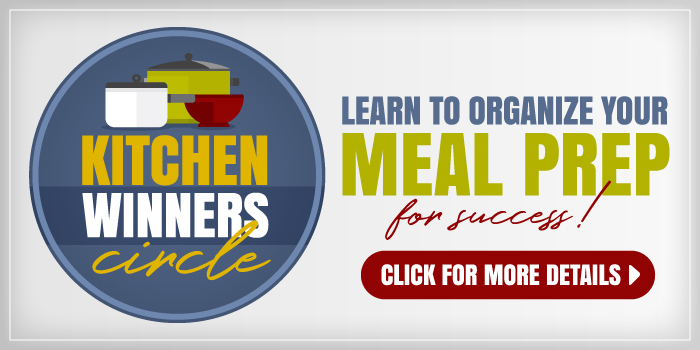 I came across this recipe in the Week of Good Cheap Eats: Breakfast, Lunch, and Dinner plans to trim the budget. Thank you for sharing. This will continue to be my daily granola for a long time for sure. Hoping to win over my kids with it too and add it to their breakfast rotation. That is high praise. Thanks, Megan!